This post is sponsored by Crest. As always, all thoughts & opinions are my own! Have you tried brushing your teeth with a charcoal paste yet? I’ve wanted to try it for a long time because I would love to have whiter teeth! Crest has released Crest 3D White Whitening Therapy with Charcoal making it easier for all of us to have access to charcoal paste! Crest 3D White Whitening Therapy with Charcoal offers a new no mess approach for charcoal lovers everywhere. Adding a new formula to the Crest 3D White line, Crest 3D White Whitening Therapy with Charcoal gives us all a better way to brush with charcoal with less mess than you’ll find with traditional charcoal pastes and a more invigorating mint flavor that leaves a long lasting fresh feeling. I received a tube of Crest 3D White Whitening Therapy with Charcoal and was excited to try it out. When I applied it to my toothpaste, I immediately noticed that this toothpaste is striped with Charcoal and has a sparkly grey color because of the charcoal. In the past, I have been intimidated by it thinking that the toothpaste wouldn’t taste good, might make a huge mess and would be ineffective. This toothpaste defied all of my concerns. It has a fresh, minty flavor and after brushing, my teeth felt so clean. I have used this toothpaste for a few days now and I am already noticing my teeth are becoming whiter. I am a heavy coffee drinker, love acidic foods like marinara sauce and enjoy an occasional glass of wine. All of these things have wreaked havoc on my teeth through the years. With this toothpaste, I’m becoming encouraged thinking that there is an easy and affordable way to lighten the shade of my teeth! Crest 3D White Whitening Therapy with Charcoal is currently available on Amazon! Head HERE. It comes in a 3-pack and with the $2.00 savings you will get when you clip the coupon, the price is marked down to $20.09! *prices subject to change. If you haven’t tried this toothpaste yet, now is the time! Try this toothpaste out and let me know your thoughts! $3.00 off one Tide Coupon! $1.94 at CVS! I am loving all of the high value Tide coupons available lately! Between February 3rd and February 9th we can print out a $3.00 off Tide PODS coupon AND a $3.00 off Tide Detergent coupon. These coupons can be used nationally across all retailers*! Go HERE to login to P&G’s Brandsaver website. You will need to login or create a Print at Home account to then access your two $3/1 coupons! The $3.00 off one Tide PODS coupon covers NEW Tide PODS® Ultra OXI Laundry Detergent! The new Tide PODS 2.0 have been upgraded with better stain and odor removal power. My husband and I work out a lot so removing odor is KEY for us! My kiddos are messy – their favorite thing to do outside is play in dirt. So upgraded stain removal makes this momma very happy! Coupon exclusions: Offers can not be stacked. $3 OFF ONE Tide PODS (excludes Tide Liquid/Powder Laundry Detergent, Tide Simply, Tide Simply PODS, and Tide PODS 9 ct and below, and trial/travel size). $3 OFF ONE Tide Detergent (excludes Tide PODS, Tide Simply, Tide Simply PODS, Tide Detergent 10 oz and trial/travel size). This post is sponsored by Community Coffee. As always, all thoughts & opinions are my own. One of the things that cooler weather brings out in me is a desire to drink Community Coffee. Don’t get me wrong, I love coffee even during the hottest of days.. but in the fall and winter when temperatures drop, I want to drink coffee even more! One of our favorite coffees is Community Coffee. We love how smooth it is. Right now when you open your Valpak envelopes, you will find a coupon for $1.50 off any bag or single serve box of Community Coffee! The coupon is redeemable at Walmart! 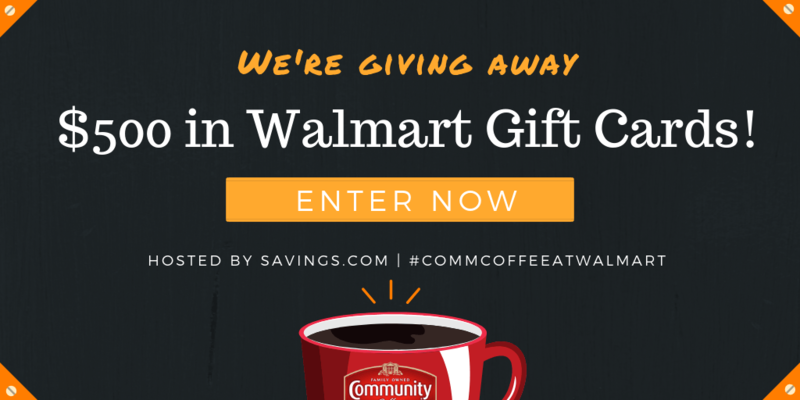 AND, right now you can go HERE to enter to win a $500 Walmart giveaway courtesy of Savings.com! Head HERE to enter and get all of the giveaway details. Giveaway ends 10/19 at 11:59 pm EST. I know that most of you love pumpkin spice this time of year. I’m going to be honest – I “like” the flavor and I really enjoy pumpkin pie… but I don’t love pumpkin the way it seems most of the world does. I have a trick that I use in the fall to make my coffees taste more like fall. When I add the dry coffee grounds to my coffee maker, I add just a sprinkle of cinnamon. When the coffee is brewed, it has a very very slight cinnamon flavor and it is OH.SO.GOOD. You must try it! In fact, if you like pumpkin spice, maybe try adding a sprinkle of pumpkin spice to your coffee grounds and see how your Community Coffee tastes then!